My mum never liked second-hand goods. She used to say 'you never know where it's been'. With this bag I have a good idea. This Revelation suitcase is from around 1965. It has seen some life. 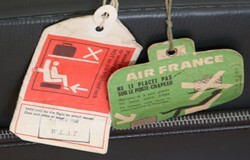 It carries an SAS label for a flight to Liberia, as well as labels from BEA and Air France. There is also a crumpled tag for WAAC (West African Airways Corporation). At the time it was the national airline for Nigeria. In the 1950s, it served the Gambia, the Gold Coast (now Ghana), and Sierra Leone, as well as Nigeria. As these countries gained independence from the UK they started their own national airline. The Nigerian Government took a majority share in WAAC and ran it as WAAC (Nigeria) from 1958. The SAS label is for a stay at the famous Ducor Palace Hotel, Monrovia in Liberia. The hotel opened in 1960. It was a luxurious modern hotel in its day. Sadly the hotel is now in a state of disrepair. The other labels tell us a bit about flying in the 1960s. Flying was a luxury, but frequent travellers discovered its inconveniences. One of which was baggage reclaim. On short trips regular flyers took one bag and carried it on the plane with them. Airliners in the 1960s did not have overhead lockers. In 1966 Mr R B Robinson had cause to complain to the cartoonist, Giles in the Sunday Express. Giles drew suitcases on the rack of a BOAC (British Overseas Airways Corporation) plane. Robinson thought you had a better chance of finding a lion or a hippopotamus there. The rack was for hats and coats. Bags went under the seat. Some travellers took an attaché case. They stuffed a clean shirt, pyjamas and underwear into it, along with their documents. Revelation made this bag in the mid-sixties. It has a label which says 'Revelation for cabin carriage'. There is a tiny BEA logo showing airline approval. BEA (British European Airways) together with BOAC were the forerunners of BA. The case has a zipper pocket on the side for paperwork. It is large enough for overnight luggage. Grey was fashionable for the mid-sixties. According to a correspondent in The Times, the 'sludge' colours were the latest thing for 1965. They went with anything. Bright or 'gay' colours for luggage were on the way out.